In Christianity, one tends to clean up before going on stage. You want to make people proud. Be encouraging. Make sure your story ends with “but that’s when God came and saved the day.” Tell testimonies that end in redemption because you gotta give people something to clap for, right? I have to do no such thing. In fact, I wrote a reminder on my dry erase board to WRITE THE UGLY because it’s necessary. If you don’t talk about failure and tragedy, you think all the victories came easily. If you don’t know the lowest points I swing through, then my high points have no value, perspective, or impact. If I don’t “write the ugly,” someone may read the published highlights of my life and think resolution, penitence, and clarity are how every day ends. Not so. Today, I am depressed, melancholy, and isolated. The feeling has been increasing for the last 2 weeks. I don’t know why it started. I am extremely irritable and have cursed and snapped at friends and acquaintances. There is a long list of apologies to give. I am not ready to give any of them. Today, I am not full of faith. Today, I believe God is going to do neither the wonderful things he promised nor the awful things he threatened. I don’t know where God is. And I hate when people say “you have to seek God.” This makes me angry because I don’t think he should be hiding. Why isn’t he seeking me? Whatever happened to going out and leaving the 99 sheep to find the 1 that’s lost? This is not the first time I’ve felt like this. I hate being angry and lost, and I hope it changes. I feel ugly. But for what it’s worth… at least today, it is written. ← Why Do Christian Artists Need To Lie? I am in a similar place, waiting on faith to return from wherever it is hanging out. I have no encouraging advice, just know you are not alone. As often as I’ve heard “you are not alone,” I can’t recall a time I didn’t need to hear it. Thank you. Mark – another insightful article sir! 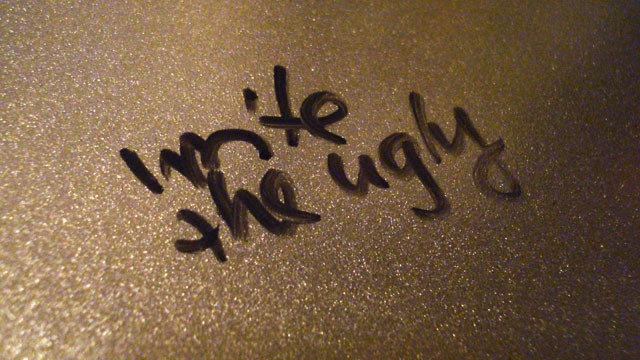 Writing the ugly is part of being real, authentic, and “keeping it 100”. When we leave out the ugly to prevent shocking the saints, or unnecessarily dwell on the ugly to simply get more sympathy, we get off target. I think the Bible is replete with “ugly” that was left in so we could see the depravity of man. I think of David putting faithful Uriah on the front line, Tamar being raped by Absalom, and how Lot threw his daughters out to a lust-crazed throng to protect the divine messengers. Straight ugly! And to make matters worse, every situation was not resolved (like a melody) to my satisfaction. But I am not God. I know God dont like ugly, but even He leaves it in sometimes for effect! I am good with your “effect”. Hope I made you smile! On my dry-erase board it says “serotonin”. I hope there’s some sort of mind-body connection that occurs when I look at it to remind me to produce more of it. I answer to the call to write the ugly as often as i can, and sometimes, no one wants to hear it. As long as you shout something into the void, whether in pen or in speech, it must reach God’s ear. He isn’t hiding, but I think He’s so much a part of everything it’s so easy to forget how close He really is…Maybe we all just have bandanas around our heads, looking for a place to pin the tail on the donkey…It shouldn’t be that hard, but why does it FEEL that way? Maybe because we haven’t heard the voice of Jesus guiding us to the target, or felt his steady hand leading us. We like the push and pull relationship with God, it makes us feel powerful, and powerless. We want the choice between the two. We want to struggle to find that target. Why? Because we’re humand humans historically are idiots… I am speaking to myself primarily hear..this may not apply to you, but I, too am shouting into the void. Hey Rose, it’s good to hear from you again. Personally, I went through some major transition and had to talk to some people face to face & learned that when I was blunt I got some really interesting responses. The only people that understand are the people who went through those times & learned compassion after the test…yes compassion, many people like to say the word, talk-the-talk but don’t know how to live it out and express it to others in need. I’m happy you can identify with something I wrote, but sad that this is the one today! !